The Belgium forward played 63 minutes and scored a penalty in the under-21s' 3-0 win over Bolton on Monday. It was his first action since rupturing his Achilles at the end of last season - an injury which forced him to miss the World Cup. Benteke will be assessed this week but is likely to be in contention for Saturday's Barclays Premier League visit of Manchester City. It was great to see him back out there and he played well in the time he was on the pitch. "He scored a goal, which is great for him, and his general play was good, too, considering how long he's been away from it. It will have given him a lift to get out there and play and score a goal and that's great for him." 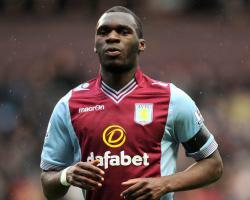 Benteke has scored 34 goals in 67 games for Villa since his £7million move from Genk in 2012 with his goals key to keeping Villa in the top flight after two seasons of struggle. They are currently sixth in the table after a 3-0 defeat at Chelsea on Saturday with 10 points from their opening six games and Benteke's imminent return is set to be another huge boost. I thought we were calm in possession, which is another positive," he told the club's official site. "L et's not let our heads drop too much from this and prepare for next weekend."